Learn how to find the workers’ compensation attorney who’s right for you. In most cases, finding the right workers’ compensation attorney requires identifying a handful of experienced workers’ compensation attorneys and then asking the right questions to narrow the list down to the best attorney for your case. If you’ve suffered a work-related injury, it’s a good idea to hire an attorney to handle you workers’ compensation claim. A good workers’ compensation attorney can gather necessary medical evidence, develop your case, and ensure you get all the benefits to which you’re entitled. But how do you make sure you hire a good workers’ compensation attorney? First, you need to identify a handful of experienced workers’ compensation attorneys licensed in Arizona. Then, you need to ask each attorney the right questions to ensure you pick the one that’s best for you. Let’s take a look at these steps in more detail. The first step to finding the right workers’ compensation attorney is compiling a list of experienced workers’ compensation attorneys. Fortunately, there are a number of resources to help with this task. Some workers’ compensation attorneys do very little advertising and simply rely on word-of-mouth. Asking your friends, family, and colleagues for a referral is prudent because these individuals are more likely to be honest with you than an advertisement. There are a number of online directories that can be used to identify workers’ compensation attorneys in your geographic area. For example, our free directory lets you search by state to find profiles of top-rated attorneys and law firms. Each profile features basic information about the attorney, including their practice areas and contact information. The State Bar of Arizona is a terrific resource for compiling a list of workers’ compensation attorneys. Every attorney licensed to practice in Arizona is required to list themselves in the State Bar of Arizona Attorney Directory. The State Bar of Arizona Attorney Directory allows you to search for an attorney by practice area, including workers’ compensation. When you click on a specific attorney, the profile page for that attorney will pop up. There are a couple of important things you’ll want to look for on the attorney profile page. First, the page lists any disciplinary history (i.e., instances where the State Bar of Arizona found that the attorney committed misconduct). Second, the page lists the attorney practice areas. Third, the page often lists whether or not the attorney offers free initial consultations. Once you’ve narrowed your search down to a small handful of experienced workers’ compensation attorneys, you’ll want to ask each attorney the right questions to ensure you identify the attorney that’s best for your case. Below are some questions to consider asking. Enjuris tip: Download our free worksheet with questions to ask an attorney to help determine if he or she will be a good fit for your case. How long have you been practicing law as a licensed attorney? Lawyers who handle workers’ compensation claims often charge the same fee no matter how long they’ve been practicing. This means that a less-experienced lawyer isn’t necessarily a less-expensive lawyer. In the legal field, experience matters. You’ll want to find out how long the lawyer has been practicing as a licensed attorney. What percentage of your practice is devoted to workers’ compensation cases? 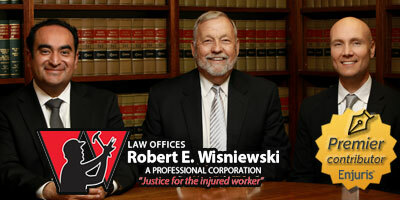 You’ll want a lawyer who devotes most if not all of their practice to workers’ compensation claims. Keep in mind that workers’ compensation cases can be dramatically different than other types of injury cases. Ask the attorney what experience they have handling cases with facts and injuries similar to your case. Will I be interacting directly with you or someone else at your office? A workers’ compensation attorney won’t necessarily handle every aspect of your case. The attorney may have a paralegal who assists in the preparation of certain documents. If you hire a senior attorney, they may have an associate attorney who does a significant portion of the work. This isn’t necessarily a bad thing. A good attorney can effectively allocate work in order to move your case forward efficiently. If another attorney will be heavily involved in your case, you should feel comfortable asking to meet with that attorney as well. Can you provide me with references and testimonials? Workers’ compensation attorneys generally work on a contingency fee basis. This means that you won’t pay a fee unless you’re awarded workers’ compensation benefits. If you’re awarded benefits, your attorney will take a certain percentage. In Arizona, this percentage typically ranges from 5% (for very simple cases) to 25% (for cases that require court appearances), with most cases falling in the 20-25% range. Enjuris tip: The Industrial Commission of Arizona (ICA) will fix a reasonable contingent fee if the injured employee and the attorney are unable to agree on a fee and either party files an application requesting ICA to set a reasonable fee. Are you searching for the best Arizona workers’ compensation attorney? Visit our online directory to see a list of top-rated law firms near you.